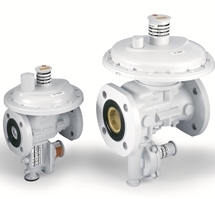 The MR Series 6 is a balanced medium pressure regulator which incorporates a limited capacity relief valve and a safety shut-off valve ideal for distribution stations, industrial and commercial applications. The MR Series 6 is available with flanged or thread connections 25mm and 50mm. Outlet pressure range 2 to 30 kPa depending on the installed pressure spring. Typical flow capacity is 100-800 m³/h with an inlet pressure range of 10 to 600 kPa. Inlet pressure resistant up to 1600 kPa. The Landis+Gyr Gas Product Selection Program is a multi-faceted program that is designed to assist in the selection and sizing of the gas products sold by Landis+Gyr and includes all Product Brochures, Instructional Manuals and Parts Lists. Abonnez-vous à notre infolettre pour recevoir nos white papers, eZines, et plus.